Museum 2.0: Rethinking Membership: What Does it Mean to Belong to a Museum? Rethinking Membership: What Does it Mean to Belong to a Museum? 'Twas the night before Thanksgiving, and my mother-in-law had an important meeting to attend. She's only been a member for a few months, and we're visiting from a thousand miles away, but there are about 40 other members expecting her. When she has to travel, she finds a group of members in that other town and meets up with them. If things keep going well, soon she'll "graduate" to a lifetime membership (free), and she's considering getting training to become a leader for a group in her own town. As a member, she enjoys a weekly interactive, social experience that supports her personal goals. What kind of membership inspires such loyalty and participation? Weight Watchers. It's social, it's supportive, and the membership is sustaining. They have an innovative model: pay when you start, then attend for free once you have reached your weight goal. Slip, and you're back to a paying membership. The leaders, who are paid, are all former members who reached their goal. Museum membership is not nearly as healthy as that of Weight Watchers. Museum members aren't ideological, like members of a political party or a movement. They aren't social, like members of a church or team. They aren't motivated by support for a perceived community service, like members of NPR or the Sierra Club. Today's museum members are mostly "value" members, people who join based on a calculation of savings in admissions fees over a number of yearly visits. What's wrong with value members? Consider the largest vendor of value memberships: fitness centers. Gym memberships, like museum memberships, are often bought based on future intentions rather than current activities. If you are not someone who works out, you assume that buying a gym membership will motivate you to attend. But the gym experience, like the museum experience, doesn't welcome you into a social, supportive environment that rewards your membership. It just offers services and equipment, to be used or ignored. And the reality is that 9 out of 10 gym memberships are abandoned. The financial incentive to use the services of the gym are not great enough to overcome personal obstacles to use. The same argument may be made of value members at museums. Museum memberships are bought based on a calculated intention to return, not a realistic assessment of museum use. Membership does not a frequent visitor make. Most membership purchases are made before entry (at point of sale) rather than after a visit. This means that people assess the "value" of membership based on the cost of admission, not the quality of the visit. I'd offer an uninformed guess that people who join a museum on their first visit are much less likely to renew than those who join after one or more visits. It's the difference between buying a subsidized perk for something already in your life and something you intend to, but do not currently, do. So the first problem with value members is churn rate; like delinquent gym members, museum members who find at the end of the year to have under-visited do not renew. But the other problem with value members is that they are hard to cultivate into higher-level donors. They didn't join to support the institution and are unlikely to respond to calls to do so. The membership is a personal purchase, not an investment in their organization. How did value membership rise to prominence? Over the last twenty years, the museum industry has moved towards greater reliance on gate sales, due to rising commercialism and diminishing government support. And the result, in part, is the invention of a new, successful product: the membership as discount. Membership effectively packages the museum experience--in some cities, a group of local museum experiences--into something repeatable at low cost. But value membership is an impersonal commodity, one among many in the experience economy. It doesn't inspire the same kind of volunteerism, social engagement, or support as other membership models. How can museums move towards more successful models for membership, while retaining the expected perk of free admission? Hook members as donors by giving them some control of their funds. Value members think about how the membership affects their wallets, not how it (positively) impacts the museum. Museums can make the relationship between members and donors clearer by giving members an option to elect (partially) what their membership fee supports, the way alumni associations allow people to flag their donation for athletics, scholarships, arts, etc. The Bronx Zoo's Gorilla Sanctuary transformed the "value" of admission from one of experience cost into an exercise in donation. Why not do the same with members, and allow them to flag dollars for camps, exhibits, or other programs? This has the added value of generating data about new members' interests, which can then be cultivated with targeted marketing of programs and giving campaigns. Provide a peer-to-peer social environment for members. Why is Weight Watchers so much more successful at retention than the average gym? The motivation to join is comparable, but the membership investment is in people, not equipment. The number one reason people return to specific museums is positive interaction with others (usually staff). If we want members to become active, true members of the museum community, we need to provide a social space for them to get involved. This may be as volunteers, or, more usefully, as partners and friends to one another. This is the church model of participation. Yes, church members support the core functions of the facility, but more importantly, they create youth groups, book circles, and activity teams to spend time with each other. The more socially engaged you are with other members, the more positively you feel about your membership and the institution in general. I don't think we need to provide fancy members-only programs. Instead, we should seek out and encourage alpha members to form groups and clubs that use the museum--home school groups, retired groups, date nights for singles. Providing the basics--snacks, a space, and enthusiastic support--could be enough to get members motivating each other so we don't have to do it for them. Create a slate of member benefits that support the kinds of members you want to have. Look at your list of member benefits. Are they all financial? If you are primarily offering discounts, you're going to attract a value member base. Imagine your ideal member. Is it someone who comes to the museum frequently? Someone who comes to programs? Someone who offers money or time? Someone who loves the content? Someone who wants to learn more? Some members might be best served by opportunities to serve as test rats for exhibit evalation. Others want something to do. Others want a cool set of people to connect with. Museums could be offering entirely different sets of benefits: an email address at the museum, a lending library to take artifacts home for a bit, a happy hour. Weight Watchers did this very successfully, transitioning from a business where the emphasis was on discounted food to one where the emphasis is on group support. Few people pay for their special food anymore. What they pay for is the social, educational programs. If you find it challenging to imagine what these benefits could be in a museum context, start with a similar business and extrapolate. What makes Curves such a successful fitness franchise? Each attendee has a personal interaction with a trainer--and other members--every time. What differentiates local food coops from big member stores like Costco? Food coops don't just offer discounts, they also require some level of participation by members as volunteers. Sometimes, the "benefit" of membership appears onerous from the outside, but in the food coop case, the "pitch in" spirit of volunteer work contributes to the communal ideology to which members subscribe. Move the point of sale for membership away from the admissions desk. This relates to the previous point. Selling memberships at the admissions desk reinforces the concept that it is a ticket discount rather than a more global program. If the membership is about repeat museum visits, sell memberships on the way out the door rather than the way in. If it's about supporting the museum financially, put the member desk near the donor thank you wall so that your nice staff member can explain how important financial support is to the museum. If it's about encouraging participation in programs, include it with your program announcements, and make sure you are giving members advance notice about such programs. 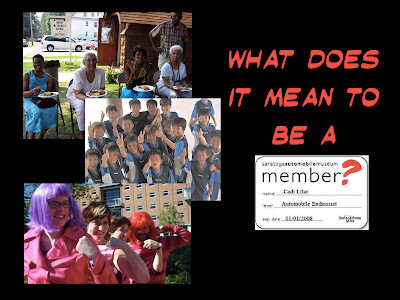 Answer the question: what does it mean to be a member? Honor the idea of membership, make it meaningful, and make it valuable. Membership can be as simple as the click of a Facebook link or as convoluted as a secret society. But being a member should make you feel proud, connected, and energized about the group or institution to which you belong. Right now, few museums offer a membership that truly connotes belonging. Make members part of your family, and they will reward you. They might even pay to show up the night before Thanksgiving. What great membership mentalities or programs have you encountered, in museums or otherwise? I'm not sure about this. I think some people join for the social capital of being able to say that they are a member. For instance, I am a member of the MCA in Chicago, a city I no longer live in, and yet I still pay dues to be a member of the museum. There is something nice about being a member, and I do not think it is all about value. Museums like the MCA in Chicago have cultivated a series of events like First Fridays where young members can mingle, dance, drink, and look at the work. When waiting in line to get in, there are tables where memberships can be purchased, thus waiving the ten dollar entrance fee (about a third of the student yearly membership). At this point, why not? It certainly is a value. But on another level, being a young person and being able to say "I am a member of that institution" has some power. And I don't think it is just money. It sounds like MCA did give you enough social and content value for you to move from a $$ value member to someone with a more meaningful connection to the institution. I am not saying that value is the only reason to be a member; rather, that it is a growing and problematic reason. Your comments make me wonder if art museums are less susceptible to the value member problem than interactive science/kid's museums. Art museums are still understood to be places that rely heavily on donors, and they are often less "attractiony" than other museums. If the MCA makes you proud to identify with them, they are doing something right. And so are you. Nina, I think this is a brilliant way to reframe membership. I would love to see museums go from member benefits that no one really wants (free calendar?! newsletter?! ), other than discounts, to experiences that have more meaning, especially in the social context. And you're the expert, but I think art museums are just as "attraction-y" as others. How often to you get an art museum membership solicitation that's tied to discounts or guaranteed tickets to an upcoming blockbuster exhibition? Heck, I'm not the expert... or no more than anyone else! The Brooklyn Museum also has a more traditional membership program, but this new membership is a pilot towards something more communal. In some ways, it monetizes a fledging community that exists via their many Web projects on Flickr, Twitter, etc. But it's also very connected to the physical, quite social experience of the First Friday events. Shelley's post on her thoughts on this new membership program are instructive. She's about as far from marketing as one can imagine. I have a question for you folks- as a membership director for vesterheim museum www.vesterheim.org - in a small rural town, about 3 hours away from a major city I am having problems maintaining let alone increasing membership.Our loyal members are dying off, we don't have a large population locally so street traffic is a problem, the only glimmer of hope is our travelling exhibit due to launch in the Midwest this fall. I hope that will begin to generate interest from a new population. I can elaborate more but for the sake of the blog I will stop here. After a brief scan of your site, it looks like you are offering a lot of high-quality programs to your local audience and reaching out beyond with things like the travel program. I'm in favor of working to get grassroots word-of-mouth support, listening to members, and providing remarkable customer service. Due to the economic downturn our museum (www.ncmls.org) budgeted to have only very modest growth this year. Thus far (FY started in Oct) we have beat our budget in membership and attendance. I credit our service and staff, not our marketing. This question/statement really is much larger of course than membership alone. Anonymous is speaking i think to the very nature of what his or her museum is and is not, and more importantly what role if any could they have now, and in the immediate future. Without knowing this museum, and completely speculating but the museum has ceased to have a role in their community, it's vibrancy has become stagnant, and thus it's membership is greying. Similiar story nationally, hard state to exist in. Few museums can bounce from this position, re-think themselves, and come out running with new purpose, new sense. Yes, they have challenges, lack of street traffic, distance from the city. But also the reality of their situation, and need, makes me think that they need to re-evaluate their future. Banking on a traveling show is not the answer, rather figuring out what role they could play in their many communities is. How aggravating for me. We actually went backwards in 2008. We were selling away from an admissions desk, and in a survey in 2007 we had 86% of respondents say they got the membership to support the museum. Now with added admissions and new desk up front, its become a value membership. I LOVE the idea of letting them decide where their funds can go!! Goodbye, Game Friday. Hello Open Source Museum.